"I'm a senior at Gettysburg College's Sunderman Conservatory studying Music Education, with a concentration in composition." "Well technically I guess I've been singing in choirs all my life. My parents were always in the folk group at my church, so I was too, but I never really got into reading music effectively and singing 'traditional choral rep', whatever that means, until high school." “Probably my first time in the Maryland All-State Chorus my junior year of high school. Spending that much time consistently around really good musicians made me realize that this was what I wanted to do for the rest of my life. I made some of my best friends at the time in the two weekends I spent there in my junior and senior years." ​"Okay this is a really hard one for me because I have musical crushes on so many people, but I think I have to go with [Eric] Whitacre. I heard his Alleluia for the first time my sophomore year of high school and knew him as 'the Alleluia guy' for a long time, but that piece is what started my growing obsession with choral music. I also have to give a huge shout out to Paul Mealor, who I got to meet with some other Lux friends. That man is not only an amazing composer but such a fun person to talk to. As a young choral geek I seriously appreciated his willingness to hang out with us for a while and pass funny stories around." "I've been bouncing around a lot lately, but I think I'm going to go with Disclosure. I've been pretty into house stuff lately, and a lot of their songs are so great to blast on long drives." "I've been really into Paveł Łukaszewski's Weary with Toil lately. It's got a lot of really unexpected harmonic turns, and the chord progression in the refrain is really a simple four-chord pop progression and it's a really cool juxtaposition for me. Tenebrae recorded it on one of their more recent albums and their sound on that piece, and really the whole album, is absolutely incredible." If all the appliances in your kitchen became sentient, which would they vote as their leader? "I gotta say the fridge. It's huge, holds all the important stuff, and I think it has the most dirt on me since it sees me at my worst. It could definitely blackmail me into voting for it." “I'm gonna say dinosaurs, only because of that movie Meet the Robinsons or whatever it was where they had a pet T-Rex and it acted like a giant puppy. That's what I need in my life." “New York Yankees. My first-ever glove was a Derek Jeter model, and I've never really looked back from there. Although my second-favorite team is the Nationals, if that makes things any better for my fellow Marylanders." Who’s cooler: John Lennon or Mick Jagger? Why? “100% John Lennon. Dude was hilarious and he was in The Beatles, so like, what's to lose?" "Oh God, is everything an option? I don't know man. From a personal standpoint, everyone in the group is just awesome, both as a musician and as a human being. Like how many people under the age of 25 do you know that are constantly listening to choral music? I feel like at least half of that population is made up of Lux members. From a director's standpoint, we're just incredibly versatile. There are at least four people I can think of just off the top of my head who have sung three or more parts, and have done it really well. That's invaluable in a chamber group like this. Everyone understands that we're here to make seriously good music, but also that we're just here to hang out and have fun as friends. The fact that we all understand both of those things allows for some really cool stuff to happen, especially for a bunch of college kids." “Definitely Sainte-Chapelle [by Eric Whitacre]. It was the piece that even made me or Tommy, or anyone else, want to do this project again, and as a mixed group. When I first heard it live, I went home that night and listened to it on a loop for literally three or four hours thinking about the story Whitacre was writing in the harmonies." "In high school, I won a national tournament with my Legion summer baseball team." Robby Napoli has just finished his ninth season with Lux. 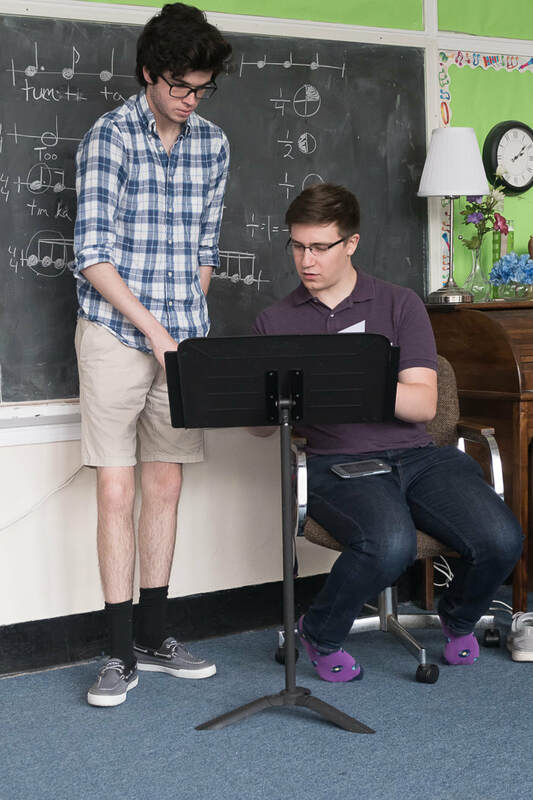 He is currently a senior Music Education major at the Sunderman Conservatory of Gettysburg College. He is primarily a vocalist, although he has accompanied many choirs as an auxiliary percussionist and assistant director with Dr. Brent Talbot. Napoli studies voice with Matthew Osifchin, and studies composition with Avner Dorman. Napoli has already established himself as both a versatile performer and a choral conductor. He has performed both as a chorister and soloist with Gettysburg College Choir, as well as the smaller, more select Camerata. He also sings with and serves as music director for Gettysburg College's premier all-male acapella group, Drop the Octave. He has been a soloist in Haydn's Missa in Augustiis and Faure's Requiem, and has performed as Samuel (The Pirates of Penzance), Rapunzel's Prince (Into the Woods), and Tackaberry (How to Succeed in Business Without Really Trying). This Spring, Robby will play Alfred in Strauss's Die Fledermaus. As a composer, he has premiered works at Gettysburg College and with the Gettysburg Children's Choir, and has been commissioned for multiple pieces at the college for choir and solo voice.